If you guys haven't know before, these islands were located in Derawan Archipelago. Each island could be reached for only 1 hour between one to another. So, i am gonna starting with my first visit in Derawan. It was this year, Mei 2015 and yes i was late. I came when everything has changed or i might put too high expectation for it. I thought Derawan would be a lovely island with the clear blue water where i could find turtle swimming here and there. But i was wrong. My friend who came 2 years ago said now Derawan has changed, it was like what i thought before, but now it turn out to be more commercial he said. Since the big increasing number of tourists, the locals take this advantage by build more and more home stays. Sadly, the high demand of staying in overwater bungalows growing up as big as the development. The local residents build more and more overwater bungalows which are going further away of the coast and almost reach the sea each day. It becomes even more sadder when seeing so many household waste floating on the water and knowing that the owner (which mostly the locals) just let them flow in the sea and pretending to not responsible of them. I once talked with the local asking how this could be happened, and he answered that it's true, Derawan doesn't has the solution about waste and he really hopes it could be solved soon. Instead of those minus points i mentioned above, Derawan is still visited by tourists. The tourists or trip planners usually stay in Derawan before going for island hopping. Derawan is the only island where kind of home stays could be found among other island is the cause. So if you already choose to start from Derawan Island, the best route for the next destination is going to Sangalaki afterwards. It will take 1 hour to get this place. Sangalaki or best known as the manta point of Derawan archipelago. This island is famous for its manta rays. I were told that it used to be black mantas, but that's changed. You can still see some but it is rarer now. On my two times visit of sangalaki island, it's quite easy to find them as they mostly swim on the surface. But, they will timidly swim down deeper if your boat gets closer. Manta rays used to be found in big waves area. So, if you are not that good at swimming, you'd better stay on the boat and watching the mantas from the deck. Because, it's quite harmful if you force yourself to get closer to them by knowing your inability of swimming. One popular thing of Kakaban Island is its famous lake. It protects many species and is considered for UNESCO nomination as a world heritage site (because of endemic jellyfish). 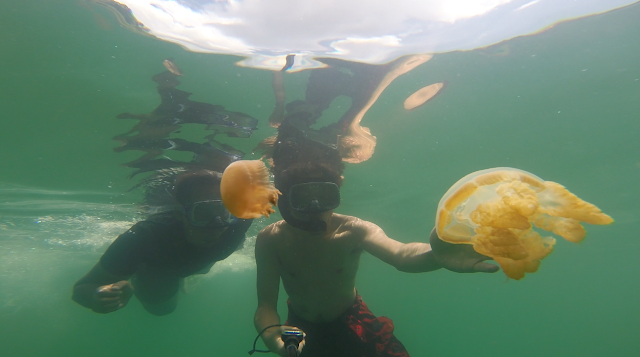 Kakaban island is well known as a place where we can swim with millions of jellyfish without sting. There are only 3 places to see this in this world; Kakaban in Indonesia, Togean in Indonesia too and Rock Island in Mickronesia. But Kakaban is the place with that many species of stingless jellyfish. 3. 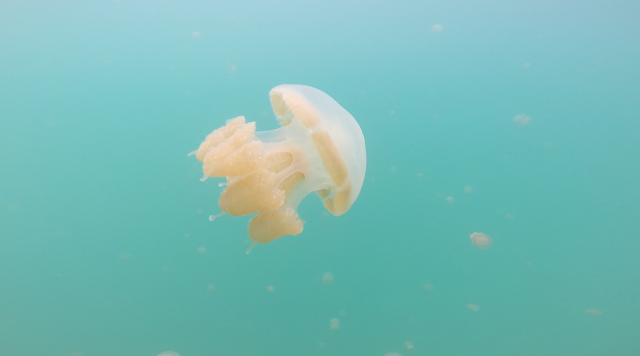 Avoid to putting your sunscreen before you swim with the jellyfish, it will harm and pollute the jellyfish. 5. 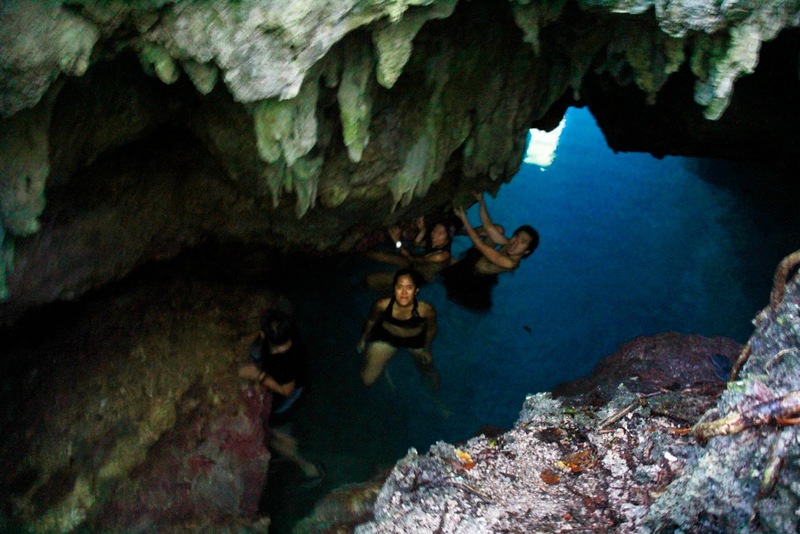 When you're done, out of the lake, kakaban island is also consisted by beautiful coral and blue water to be explored. Make sure you do snorkeling around the pier. One destination that also you don't have to be missed. This cave is very near with kakaban lake, only 15 minutes away by speed boat. Though this cave is not quite popular than the others, but i bet It would be one place which make your adrenaline going up of all other destination. Yes, it's a cave, and it's located inside the forest, so after get out of the boat, you have to walk in rocky, and slippery land to reach the cave during 5 minutes. 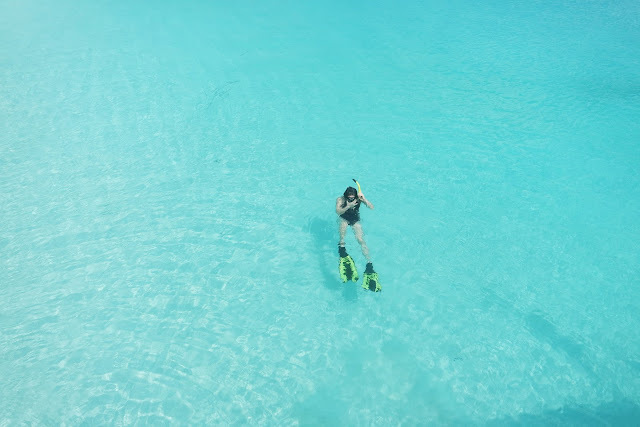 Once you are here you will be welcomed by a clear blue water which is 7 meter down of the surface. The popular activity is jump from the land to the water (it's 7 meter height). It's still funny to see people who afraid of height and took a lot of times thinking to jump (though they already ready to jump from the edge), sometimes they stepped back and shout so loudly to make their fear disappear. For me, it was such addictive, even i jumped for 3 times there. I once jumped from the 15 meter height to the sea when i was in Mandeh Island, West Sumatra. Believe it or not, it now becomes my fears of height released. haha. 1. The sun light is best shine the blue water at 11.00-13.00 but sad to say in this times, due to the low tide, the boat cannot be parked so close to the walk starting point which means you have to walk further to reach the cave (about 15 minutes away). 2. So, if you don't wanna walk that far, you'd better come between 15.00-17.00, you just need to walk for 5 minutes. But the negative thing, you cannot see the sun flare effect which makes water looks so bright. Still my favorite place of others, This island is home of a beautiful notorious white sand beaches of the Berau Islands, and also home to the turquoise blue sea. I could say it looks like Maldives version of Indonesia. The water is perfectly blue blend with the white sand texture. This is the best spot for taking picture or playing with the water, because there is no coral reef near the port. So it's only the sand and the water. Best spot in Maratu Island is in around Maratua Paradise Resort. 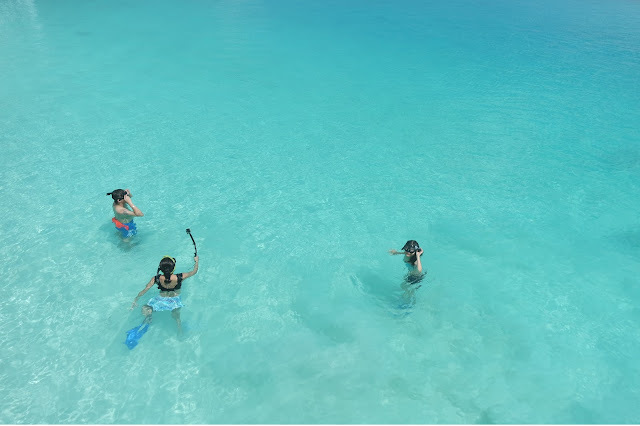 1. the best time to see the most beauty of Maratua is at 11.00 - 14.00. Again the sun light is still as the reason. 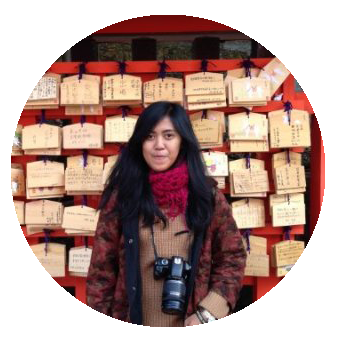 I spent two weeks to enjoying the beauty of East Borneo, Indonesia. Starting from visitied Derawan Island, and meet the stingless jellyfish in Kakaban Island, Watched Manta Ray playground, Felt the amazing experience in Labuan Cermin Lake which famous for its unique two-flavor lake water, fresh on the surface and salty at the bottom, with different types of fish coexisting alongside one another. Enjoy the movie ! - It's better to go there in a group so you can hire a rent car. - If you already arrive in Tanjung batu, and you are going alone, you can join a big boat by paying 50.000/person, or you can hire a speed boat with max 5 person for 3.500.000/boat (include island hopping for 2 days 1 night). - You can find any kind of accommodation in Derawan Island, the full AC guesthouse usually cost 250.000/room. For the home stay non-ac is around IDR 100.000-150.000/room. *i'll give you the best price.